All of a sudden on tube ABE is messing up the browser. See linked image for what I mean. 1) Can I just turn off the warning display (while keeping ABE on)? 2) Better yet - can it be fixed so it truncates to a single line? The long URL is messing up the scrollbar and requires expanding the window very wide to even get to the 'Options' button. 1) Yes - go to NoScript Options > Notifications, un-check "ABE"
2) Not that I know of. Thanks for the quick reply - not sure how I missed that option - i thought that was disabling ABE - but obviously being under the 'notifications' tab says otherwise. As far as it getting fixed - is this where a bug report is to be filed? Obviously the behaviour of messing up the browser width isn't correct and depending on your monitor size you might not even be able to get to the 'options' button since it might require widening the window beyond the dimensions of your desktop size. krbvroc1 wrote: is this where a bug report is to be filed? Yes. All you need to do to turn this thread into a bug report is post full steps to reproduce the problem. However, the specific ABE warning in your screenshot is not a good example IMO. It is indicative of a misconfigured HOSTS file. And anyway ABE is not supposed to fire any notification for blocking that request, its doing so is another bug. barbaz wrote: However, the specific ABE warning in your screenshot is not a good example IMO. It is indicative of a misconfigured HOSTS file. And anyway ABE is not supposed to fire any notification for blocking that request, its doing so is another bug. You imply a misconfigured hosts file. I use an external DNS that blocks many things via dnsbl lists - certainly doubleclick.net is one of them. Oddly, unless tube changed something this never happened prior to today so I wonder if something in a recent NS broke something. The post you linked is 3 1/2 years old...doesn't sound promising for ever being fixed. To be honest, I'm not sure a reproducible sample should be needed to fix this concept. NS, whatever it decides to display, should not be messing up the browser frame like that. When it attempts to display the URL, it exceeds the browser width but doesn't add any scrollbar. It is like wordwrapping or the window size is not computed properly. It should also truncate with a '...' after a reasonable length. Trying to display a 500 character URL doesn't seem reasonable in any case. All that left margin on the video was NOT there until NS displays the URL notification. It shifted the entire video player frame to the right by 25% or so. krbvroc1 wrote: You imply a misconfigured hosts file. I use an external DNS that blocks many things via dnsbl lists - certainly doubleclick.net is one of them. krbvroc1 wrote: To be honest, I'm not sure a reproducible sample should be needed to fix this concept. 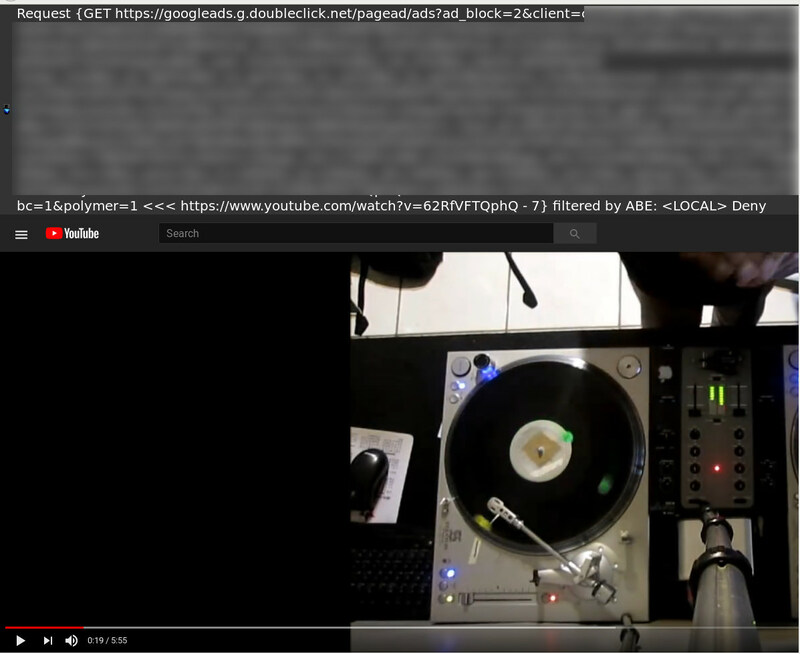 krbvroc1 wrote: All that left margin on the video was NOT there until NS displays the URL notification. It shifted the entire video player frame to the right by 25% or so. That looks like Youtube put the video in theater mode. Did you deliberately set this up for logging purposes? If not, your DNS should be returning either 0.0.0.0 or NXDOMAIN for blocked domains. That's bigger than my browser window. So I did a quick test with a massive made-up URL, and I still see the Options button. Shrinking the window horizontally did not cause the Options button to disappear. It stayed visible on screen the whole time. Does disabling all extensions other than NoScript (Tools > Add-ons Manager) prevent the disappearance of the Options button? It is the way the firewall (pfsense and the dns blocker handle it). Logging is probably the main reason - if something is being blocked and you want to whitelist it you can enable logging to troubleshoot what is being routed to that IP, etc. Not sure if having 'something' in the HTML DOM (even 1 pixel) can preserve some page layout or not. Regardless this isn't the issue - I changed the DNS to return 0.0.0.0 and same issue. I know you said you used a massive URL - I just checked - the one I am seeing is at approx 1747 chars. I only have 3 other extensions - disabling them made no difference. Widening the Firefox window to 2048 pixels shows to the Options button. Widening it further is fine - it expands. Narrowing it causes the option button to scroll off screen. It appears to be the equivalent of setting a 'min-width:2048px' on that notification area. It messes up all tabs of the browser too - even preferences tab. I tried changing default font (have mine set at 16) preferences but it made no difference. I tried zoom/unzoom the page and it scaled the video but not the notification bar. I tried normal and theater mode - same. krbvroc1 wrote: I changed the DNS to return 0.0.0.0 and same issue. Huh. I can confirm this behavior. I'm pretty sure that's not supposed to happen. Or at least, it didn't used to for me. krbvroc1 wrote: I only have 3 other extensions - disabling them made no difference. Please create a clean profile from scratch. Install only NoScript latest development build, leaving all the defaults. If yes, I suggest just disabling the notification until NoScript Webext is out. Please let us know if this is still an issue in NoScript Webext. barbaz wrote: Please create a clean profile from scratch. Install only NoScript latest development build, leaving all the defaults. With a clean profile and the devel build 5.1.5rc2 I see the same behaviour. The only thing different I noticed is that the word wrap is even worse. I need to increase the browser width to 2658 pixels before I see the first pixel of the Options button start to show. barbaz wrote: If yes, I suggest just disabling the notification until NoScript Webext is out. Please let us know if this is still an issue in NoScript Webext. I am running on Centos 7 (which uses Firefox 52 ESR). Since they are using extended release versions, I imagine we will probably remain on 52 ESR until the next ESR version comes out which is Firefox 59 ESR. How will this work with NS? Will the newer Webextensions version work on version 52 ESR? Or will older version be maintained until the next 59 ESR? krbvroc1 wrote: I am running on Centos 7 (which uses Firefox 52 ESR). Since they are using extended release versions, I imagine we will probably remain on 52 ESR until the next ESR version comes out which is Firefox 59 ESR. How will this work with NS? Will the newer Webextensions version work on version 52 ESR? Or will older version be maintained until the next 59 ESR? NoScript Webext will only work with Firefox 57 and up. But NoScript supports Tor Browser, which is based on Firefox ESR, so legacy NoScript isn't going away immediately when NoScript Webext is released.